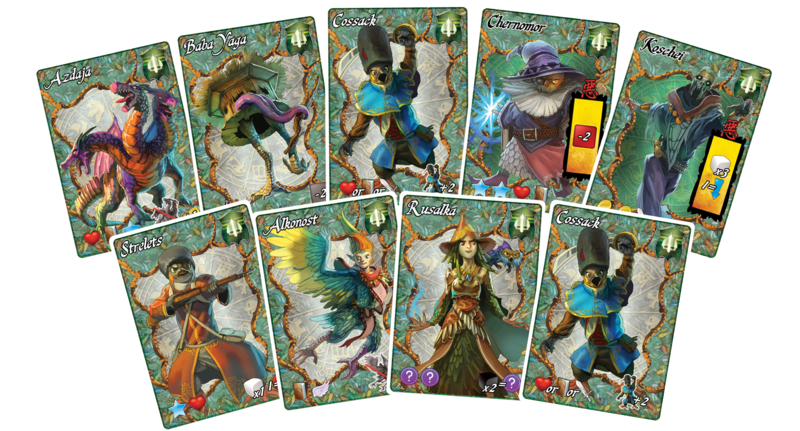 A few months ago we reviewed 12 Realms, a published version of a popular game previously available only as a print-and-play. MAGE Company brought the game to life with nifty art, minis, and in general quality components. Now, they’re back with a Kickstarter to fund an expansion to 12 Realms, called 12 Realms: Ancestors Legacy, as well as a new edition of 12 Realms with improved components and rules. We had the opportunity to ask Alex Argyropoulos, general manager at MAGE Company, a few questions about the project and the Kickstarter. Responses have been edited for length. Can you tell us a bit about yourself and what you do at MAGE company? I’m on of the founders of MAGE Company and my work has to do mainly with the financial stuff of the company and the public relationships. Of course we do more than that as you can imagine when is necessary. My work starts back at the end of 2001 when I and Michael, my partner, decided to start designing games. We were learning things but we could not do a lot of things since we both had our normal jobs and the families so it was too difficult. We focused much more in the games and the company from 2010 and since then we have published several titles. This is what I do and I feel that I could not do something different. So we are here and try to get bigger and more people see what we do. For those who know nothing about 12 Realms, can you give us a breakdown of what the game is all about? 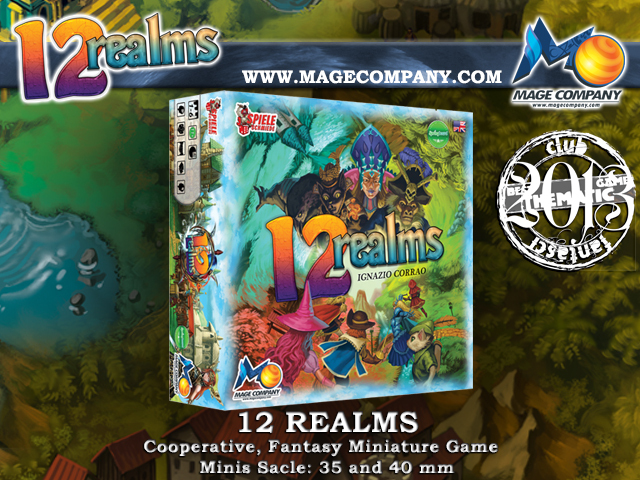 12 Realms is an awarded fairy tale, co-op, miniature game for 1-7 players. Robin Hood, Snow White, Red Riding Hood, and the otherheroes of the 12 Realms are being reunited for one last epic adventure. The Dark Lords have joined forces to conquer and subjugate allthe known Fairy Lands, and only the combined efforts of all the greatest heroes can halt their nefarious plan. All players must band together to stop the Dark Lords’ overwhelming hordes from pillaging the 12 Realms. Individual Invaders can be defeated by using each hero’s different Talents, but to vanquish the Dark Lords you must claim a powerful artifact. In their quest to stop the invasion, the Heroes can travel together between the lands or they can try to single-handedly defend a Realm. How well was the first printed edition of 12 Realms received? The EN edition was sold out in a short period, I think that some stores may have few copies. German and Italian editions have a good course. We heard the people, we found the flaws of the game and this is why we will reprint cards and rules and send them freely so people can enjoy the game even better. The feedback is always so precious. We know that people enjoyed a lot the artwork and our wok on the minis and the hand painted sets. Now we have a new manufacturer, more reliable, we have new sculptors so we want to upgrade our work and the game itself. We always support our customers and fix any possible issues, at least for that we are really proud. You mentioned fixing some issues from the first edition. What were these issues and how did you fix them? In the campaign we prepare we will not only publish the next edition of 12 Realms but also reprint the basic game with some changes and improvements as I said which are the following: The unpainted minis will be glued to their bases and a little harder, we have created a Reference Sheet recommending how to combine the game with the Variants with suggested ages and playing time etc and the rules have been enriched with detailed FAQ which cover some issues and show in details each card. Those who have the basic game and will support Ancestors Legacy will get for free the reprint kit of the first edition (cards and rulebook). Ancestors Legacy has another rulebook, its own rules and stories. Because we found a much much better manufacturer our quality will be much better. So you’ll provide replacement cards and updated rules for those who have the first edition. Is the only way to get that by backing in this campaign? You can back Ancestors Legacy and get it free or you can pay it as add on item and get the reprinted material. So there are 2 ways. What can you tell us about this new expansion? Exciting adventure begins as 12 Realms returns with an expansion entitled Ancestors Legacy! Four exciting new Realms lie hidden in the Fairy world and you must prepare yourself to explore them so as to defeat all of their enemies. Kievan Empire, Golden Caliphate, Olympia, and Nile Valley are the new lands you will get to explore to learn their secrets. Ruslan, Prince Ivan, Sinbad, Andromeda, along with the rest of the heroes, will unite to fight against Marid, Sobek, Anubis and the rest of the Dark Lords. Do not underestimate their power this time! Ancestors Legacy will provide a much different game through its Plots. There are now three different Plots for both the first edition and the new one, which will include a background story and will significantly increase the difficulty and excitement of the game – increasing the amount of decisions that players will have to make. Now, more than ever, team camaraderie will be necessary in order to reach victory! For each of the three Plots, you will discover different and customizable game set-ups. The biggest challenge of this edition will be comprised of two specific plots which will take the game to an entirely different level. Plots are something completely new for 12 Realms. A Plot may have you playing with six Realms (combining old and new lands), facing all of the Dark Lords, or creating a really fast game with a unique set-up. No matter what your choice will be, Ancestors Legacy will take you to another world where your actions will determine the future of the Fairy lands and all the known Heroes. Those plots sound interesting. Can you give some specific examples of how a plot changes the game? What specific choices might have to be made by the players or what mechanisms or elements are added to the game? Ancestors Legacy will provide a much different game through its Plots. There are now three different Plots for both the first edition and the new one, which will include a background story and will significantly increase the difficulty and excitement of the game – increasing the amount of decisions that players will have to make. Now, more than ever, team camaraderie will be necessary in order to reach victory! For each of the three Plots, you will discover different and customizable game set-ups. The biggest challenge of this edition will be comprised of two specific plots which will take the game to an entirely different level. Plots are something completely new for 12 Realms. A Plot may have you playing with six Realms (combining old and new lands), facing all of the Dark Lords, or creating a really fast game with a unique set-up. In each Plot there is a different winning condition, some different rules and mechanics. The basic mechanics of the game do not change, we just add few more to make the game more challenging plus we make some suggestions with how many players and variants you can play each Plots. We have prepared 8 and we hope the 5 of them be revealed through our KS campaign. We will mention the 3 of them when the campaign starts. But I will give you a tip for the moment: 1 – Double Challenge where you face both dark lords, the marker moves fast and you can use both dice at the beginning of the game. Is a hard mode and you can win/lose 50/50, so you must work perfect with the other players.2. Chase their Brooms: The Dark Lords released the Witches over the Realms and now you must capture them! They’re called “Plots”- do they actually weave a story arc? Do you play through them like different chapters of a long book, or are they just random scenarios to add new twists to the gameplay? Question 10: Any last comments you have? Care to make a pitch for why someone should back this new edition and expansion on Kickstarter? There is a significant Plot which is exclusive only for KS and Spieleschmiede campaigns. There are few more exclusive stuff for KS. Those who back the expansion will get for free a reprint kit of the first edition (cards + rulebook). Of course there is and as an add on option so anyone can get it. The gameplay changes significantly since the winning conditions are altered in each mode plus there are new mechanics. 12 Realms: Ancestors Legacy is now on Kickstarter. Hit that link to back the game and get access to the original with upgraded components as well as the exciting new expansion! This article was paid for by MAGE Company to promote a Kickstarter campaign.